Experience a better shower with the control and flexibility of a Delta. hand shower. Great for showering yourself or your loved ones and pets, as well as for keeping your shower and tub clean. While other products may gather unsightly mineral build-up over time, Delta soft rubber Touch-Clean. spray holes allow any mineral residue to simply be wiped away for an instantly refreshed look with no need for soaking or the aid of chemical cleaners. 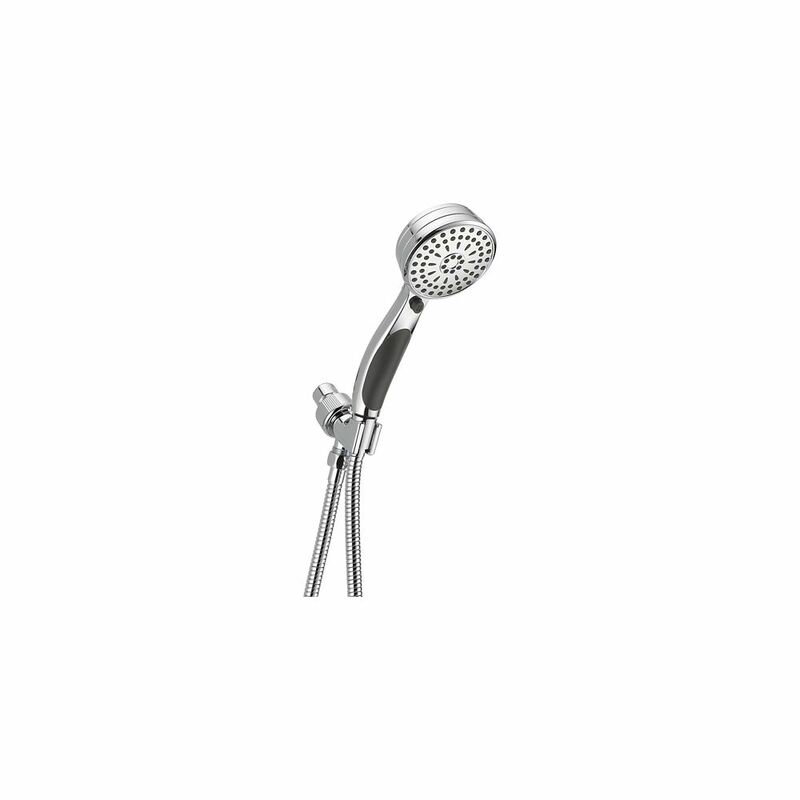 ActivTouch 9-Setting Shower Mount Hand Shower, Chrome Wash the day away with this multi-functional hand shower. We've got you covered from top to bottom, or bottom to top, giving you water anyway you need it, anywhere you need it. Innovative Pause feature allows you to conserve water while lathering up. ActivTouch 9-Setting Shower Mount Hand Shower, Chrome is rated 4.2 out of 5 by 101. Rated 5 out of 5 by Frank from This is a very well made shower head. Many more metal parts where other cheaper brands use plasti... This is a very well made shower head. Many more metal parts where other cheaper brands use plastic. Durable, excellent selection of spray modes. This is my second one and still a nice strong 2.5 GPM flow rate, which is much better than a lot of those weak spraying shower heads that barely give you enough to wash all the shampoo and soap away. Also, I love that the round part mounts high above so that a 6' guy like me can stand up straight instead of having to bend over to wash my hair and face. 5 stars, I love it! Rated 4 out of 5 by Thomas from Easy assembly, acceptable water spray pattern. Improvement over older... Easy assembly, acceptable water spray pattern. Improvement over older Delta hand spray. Rated 4 out of 5 by Snookie from Works well but.... I bought this style because the user only has one hand to operate it. The wand itself works very well but the buttons are quite hard to push so not so easy to change sprays or pause using one hand only. Rated 5 out of 5 by Beangrinder from Our existing shower head had a dial to change the spray patterns, and it was very, very hard to t... Our existing shower head had a dial to change the spray patterns, and it was very, very hard to turn. This Delta model we bought had pushbuttons instead, and they are very easy to work. Although I didn't count on this, I also found the spray came out so strongly that it felt like taking a shower back in the day where you didn't have to worry about water conservation. Great product! Rated 5 out of 5 by parkwaygirl from We like everything about this product. Excellent quality and style. The included mount moves easi... We like everything about this product. Excellent quality and style. The included mount moves easily to adjust position of shower head. When removed from mount it fits comfortably in hand. Hose is long and flexible. Exceeded our expectations. Have already recommended to others. Rated 5 out of 5 by Marine from Very easy to install; no tools required for my application; only took about to 10 minutes. Defini... Very easy to install; no tools required for my application; only took about to 10 minutes. Definitely adds elegance to the shower. The 9 shower selections is sure to please everyone in the household. I highly recommend it. Rated 5 out of 5 by snickers from Great product! Great product!